June was a great month, as it was my third 30 day yoga challenge! I can’t believe the “Do yoga every day for a week” goal on my list of 101 things to do in 1001 days turned into three month long challenges! Amazing. June was such a busy month, I didn’t blog about my challenge as much as I thought I would. I didn’t take many pictures either. The thing is, it felt less like a challenge (for the first half, anyways). I was going to yoga three to four times a week anyways, so going everyday wasn’t quite as difficult as you would think. The second half happened at the same time as report cards, field trips and end-of-the-year crazyness, so it was a little tougher to motivate myself to go to class, but I think all the yoga helped me deal with everything. Now, on to the best moments of my month caught in pictures! Learning a new yoga pose. Bird with a broken wing, grasshopper or dragonfly, depending on who you talk to! Going to the library book fair. 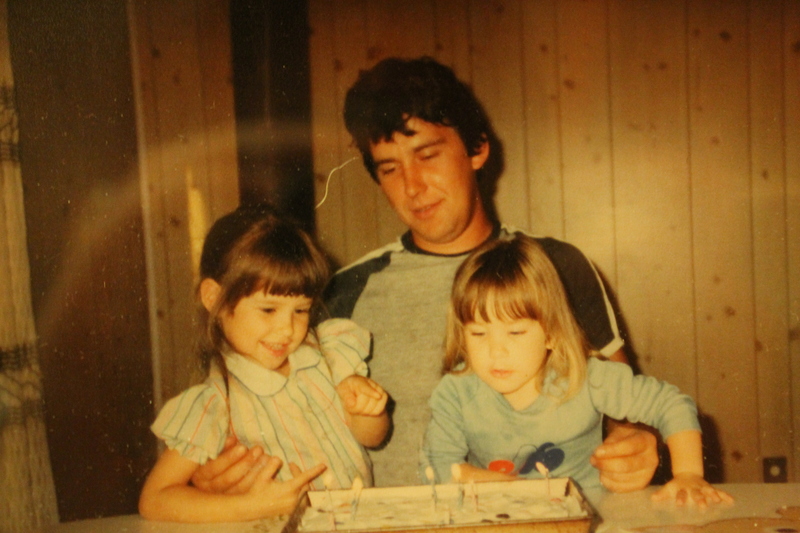 Spending father’s day with my dad. 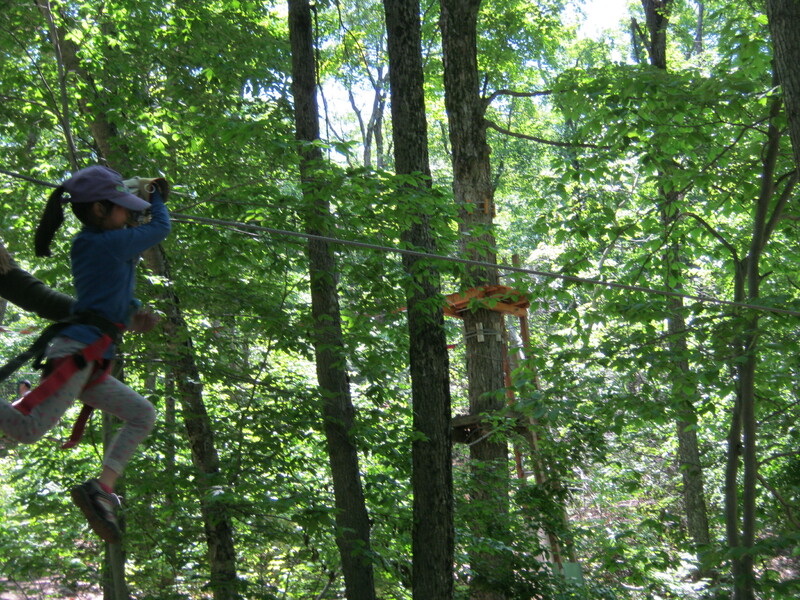 Going ziplining with my students. Kids are brave. 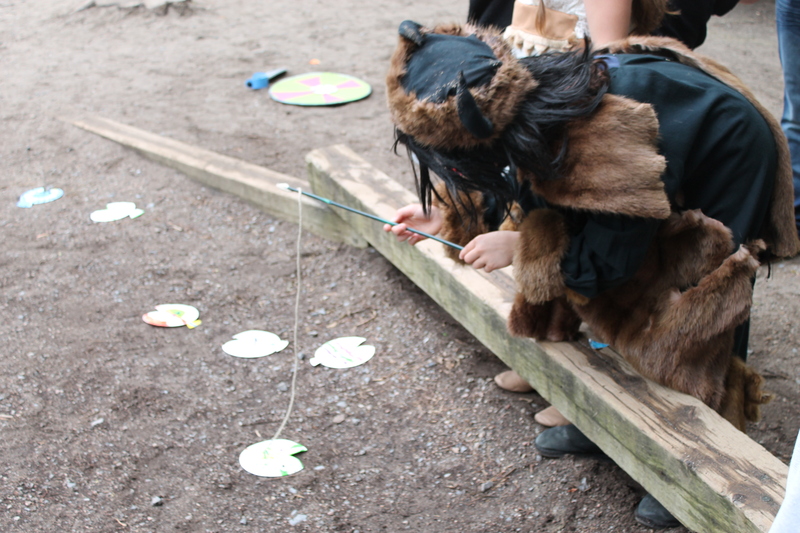 Viking day with my students. 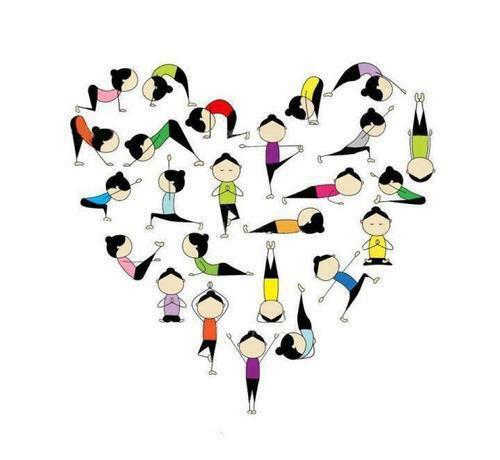 And, with the end of June came the completition of my 30 day yoga challenge and the start of my summer holidays! Bliss. I don’t have a very strong core. I have strong legs and arms, but not my core. That’s ok, because I can work on it and get stronger. The thing is, I don’t like working on my core. I don’t like planks and dolphin push ups and a million boat poses. I don’t need a six pack. The other thing, however, is that I really, really want to do a headstand, a handstand, a forearm stand, and any other inversion. You need a strong core for that. I’m on day 5 of my 30 day yoga challenge, and the only class I could fit it yesterday, on day 4, was a core flow class. I usually avoid this class, although I love the teacher (hi Amber!). I go to her other classes, but not this one. Except for yesterday. I thought I would put together a helpful little list for anyone who might not know what they’re getting into. 3. Ok fine. If you’re going, don’t take it too seriously. 4. Ask the teacher to go easy on the core work. 6. Do dolphin pose. Do one dolphin pose push up to see what it feels like. Forever avoid dolphin pushups. 7. When you do side plank on your forearm, you can’t adjust your arm without falling down, it’s kind of holding you up. Not that I fell or anything. 8. During the 24 minute plank pose, just hang out on your mat like you’re at the beach and tell yourself everyone is so busy not passing out that nobody will notice. 9. After class, don’t ask your teacher if she noticed you wimped out on most of the poses, because when she says she didn’t notice, you can’t really laugh and say “Haha, just kidding, I did it all!” She won’t believe you. 10. Your abs will hurt the next day when you laugh, even if you only did a third of the planks (that’s still like 32). 11. Go out for dinner with your girlfriends to reward yourself for all your hard work. Today I went to yin, because there was no way I was doing a power class! I think tomorrow might be a yin-day as well. 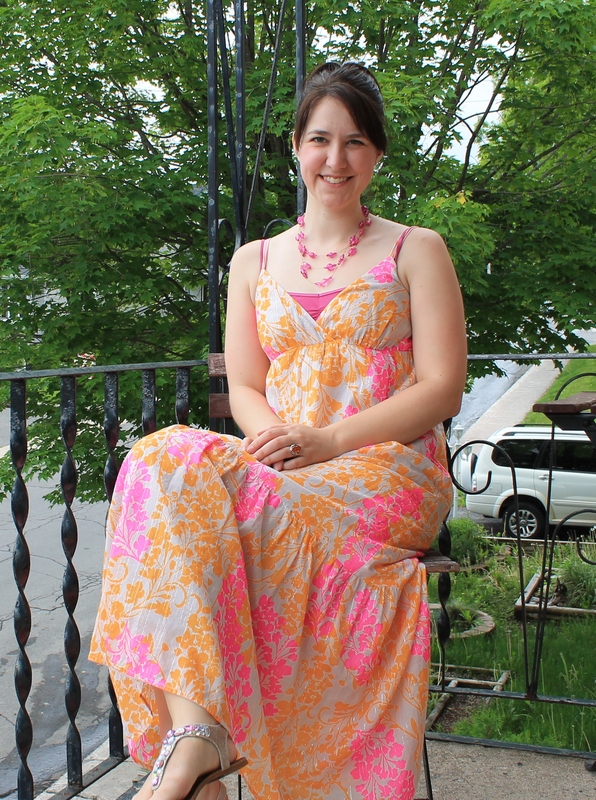 I’ve been wearing dresses for my week long dress challenge too. It’s so much easier to wear dresses than to do a core class! Today was day three of my 30 day yoga challenge. Two of my friends from work are also doing the challenge, and today we realized we all planned to go to the same class, so we had ourselves a little post-work yoga party! 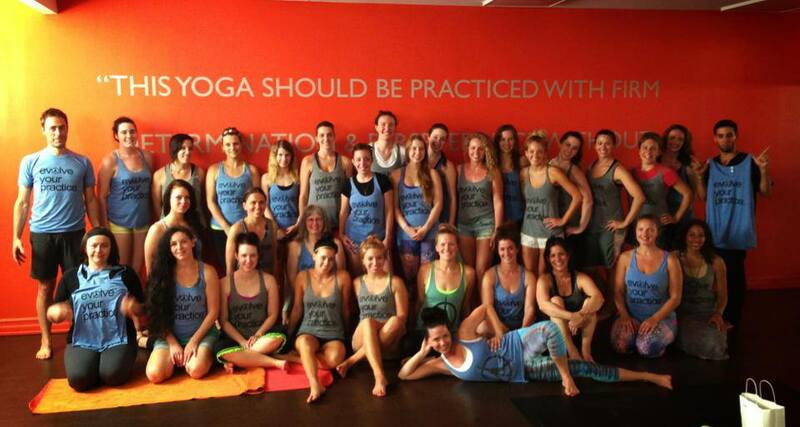 The class was prana vinyasa and it was led by Megan. There’s something special about her classes. The way she puts everything together, the pace of the class, I always work hard, but I don’t need to take a lot of breaks. Towards the end of class, when I was good and sweaty, she led us into a twist, then offered different stages of the pose. By this point, I was feeling a little tired, but one of the options was an arm balance, and I never turn down an arm balance! I tried on one side, but I was so sweaty my foot slipped right off my arm and I fell down. Then, on the other side, I decided to try again. Megan was beside me and she guided me into it, and I did it! It only lasted half a second before I fell, but I still did it! 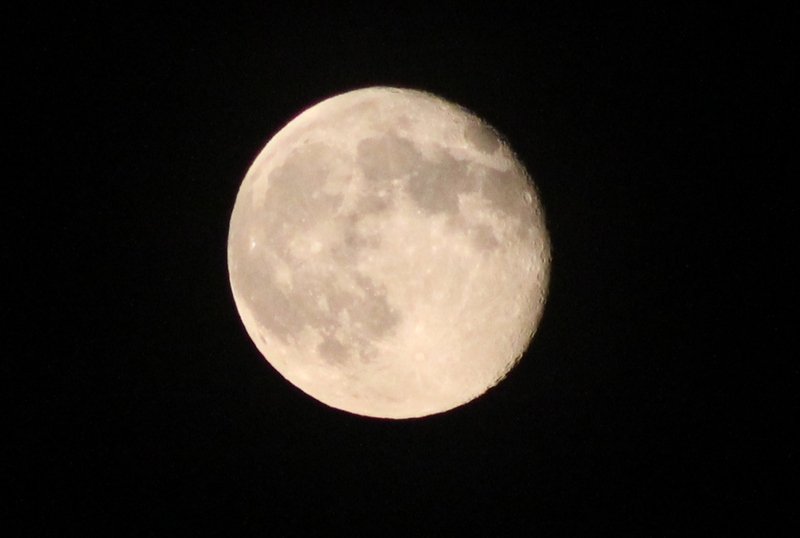 I tried to do it again when I got home, so I could take a picture, but it was hard! These are the best I got. 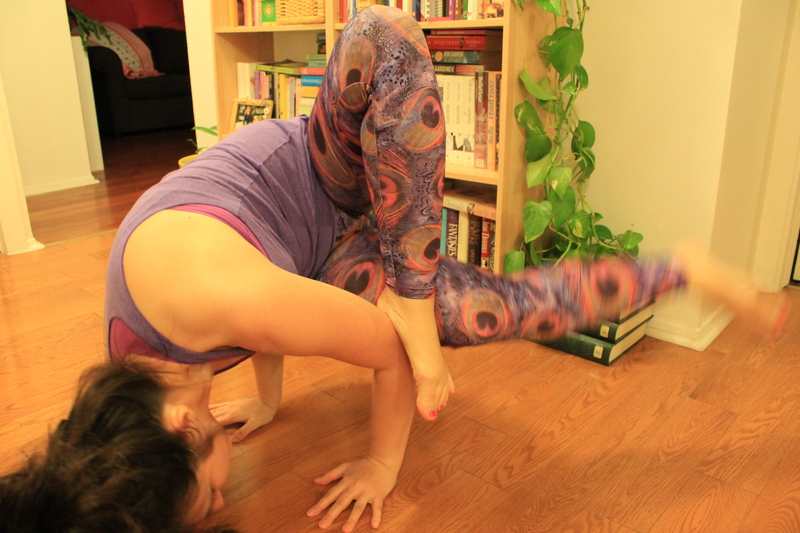 I need to bring my foot up a little higher on my arm, but it makes me happy to have a new pose to work on! Today was also day three of my week-long dress challenge. 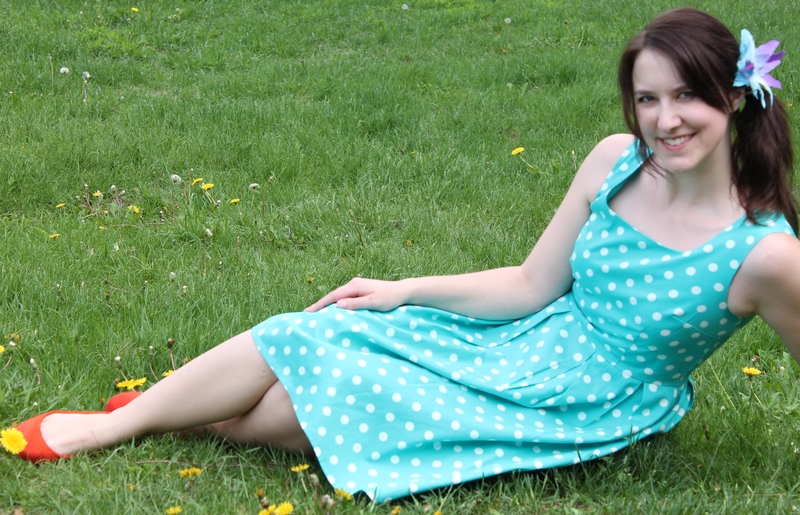 I’ve had this dress for a few years, and I’m still not sick of it! I’ve recently become obsessed with Zooey Deschanel. Ok, maybe not obsessed, but that girl has some serious style! Not to mention talent as well. 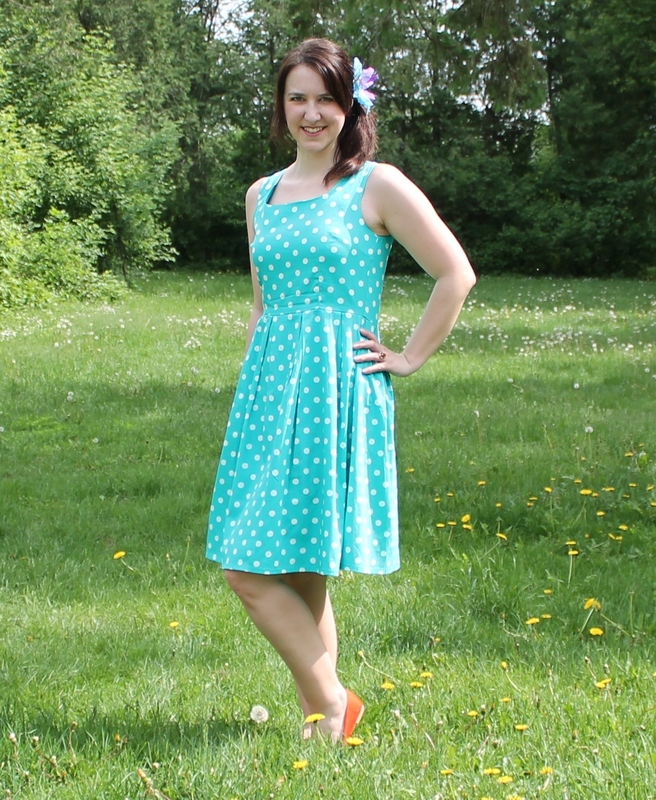 Let’s just say she influenced part of this post, which is all about dresses, books and yoga. How fabulous is that combination? 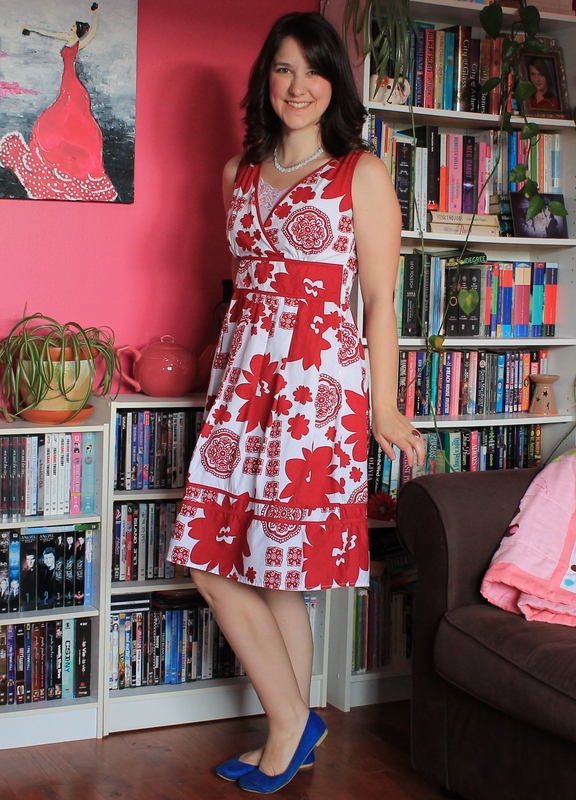 Earlier in the week, I posted a teaser of a dress I bought. I originally saw it at Winners, but they didn’t have it in my size, so I went to another Winners. Again, no luck. It was perfect, but I was resigned to not having it. Then, I went to Marshall’s with my friend Suzanne and she said “Look at this pretty dress.” It was my dress! And in my size! It was fate I tell you, fate. The very same day, I saw a cd at Starbucks from a duo called She and Him. It was Zooey Deschanel and a guy (I’m sorry, I don’t remember his name.). I didn’t even know she sang. When I got home, I looked it up. Not only does she sing, she writes her own songs. 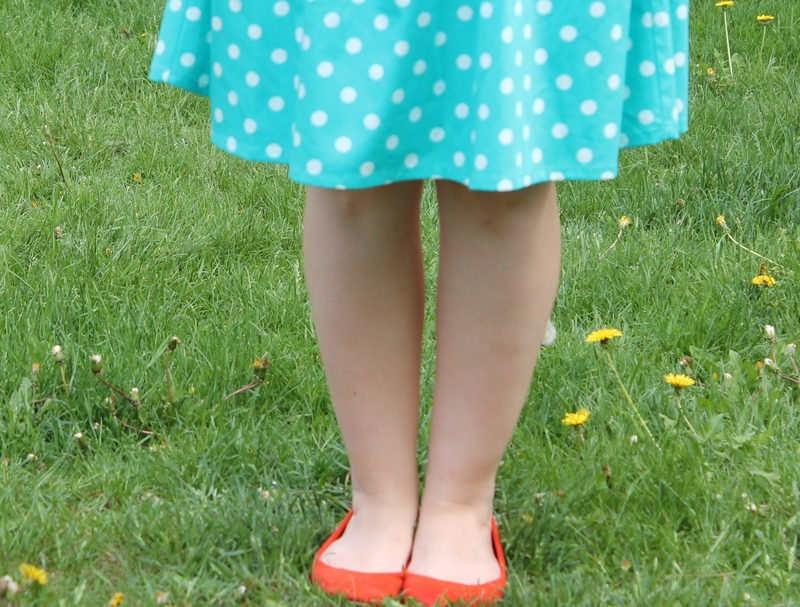 Plus, my new dress could totally be in her video for I could have been your girl. I’ve been listening to the cd all week. I love it! 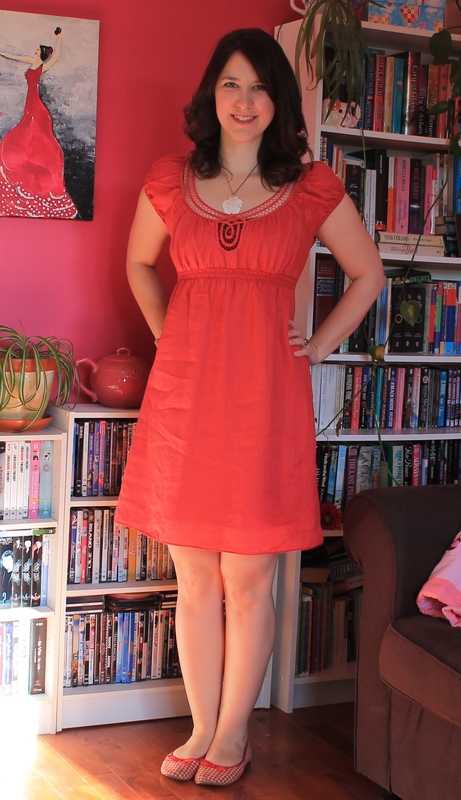 Back in December, I participated in Dressember, which was a challenge to wear a dress every day for the whole month. 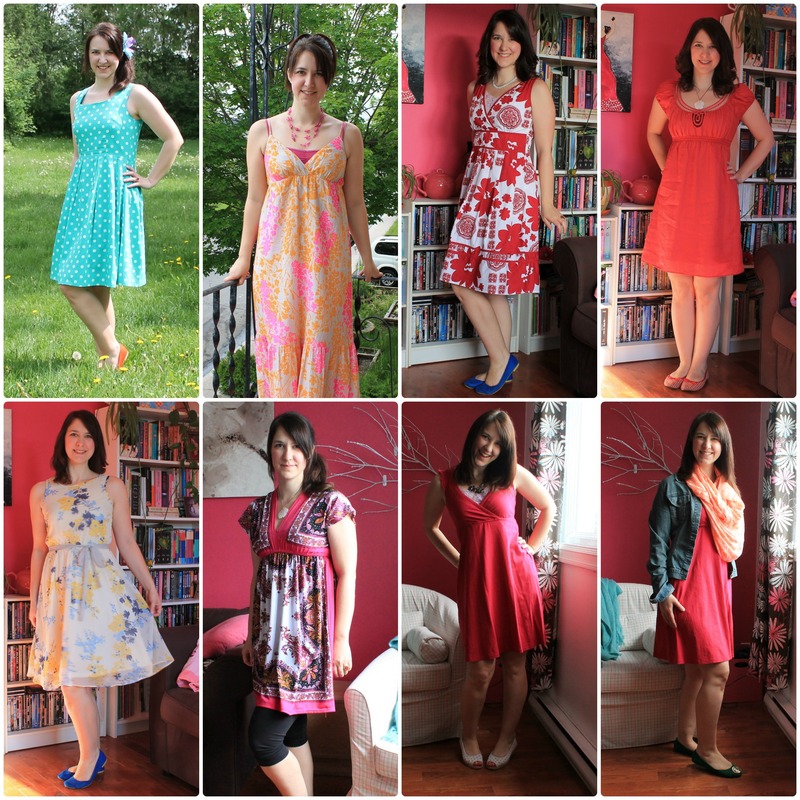 The Dressember creator decided to have a summer challenge so we could show off our pretty summer dresses. 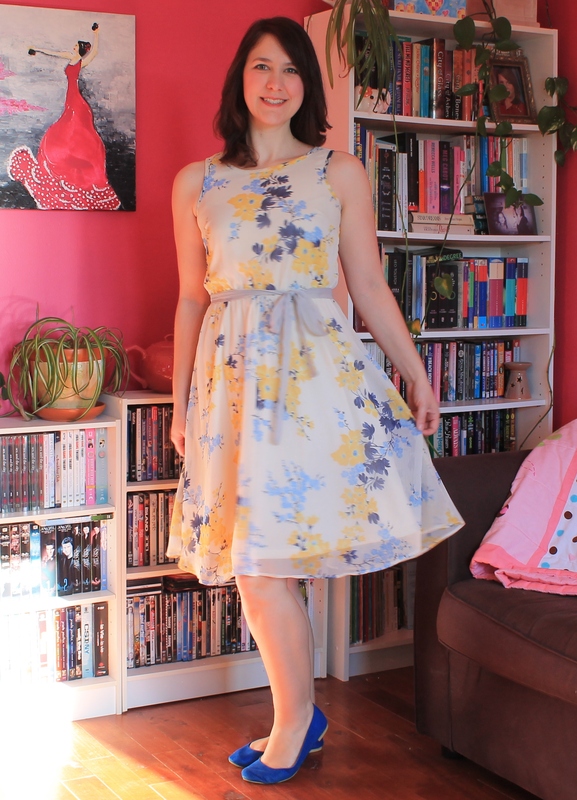 It’s only for a week this time, but I was super excited to wear my new dress in a Zooey-inspired style! That was day one of the dress challenge. Today was day two and it was very grey and gloomy this morning, so I went with bright colours to balance it out. I’ve already got my dress picked out for tomorrow! 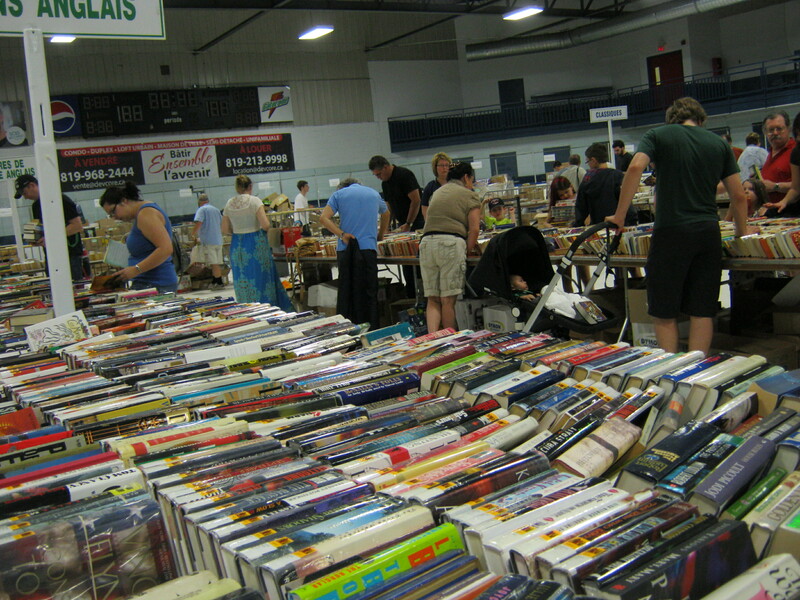 Today was one of my favourite book-related days of the year. 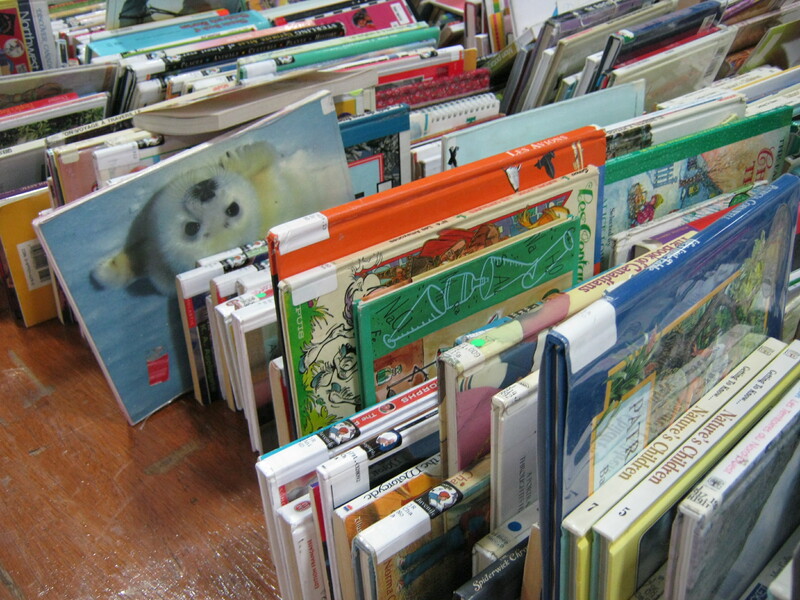 The library book fair! Woohoo! (I know. I’m a nerd.) They sell old books and you pay by weight. I didn’t actually notice what the price per kilogram was, but it wasn’t very much. There were a lot of people and it was muggy in there, so I didn’t stay very long, but I was so happy I got to go! They also sell really, really old books. Last year, I bought a 100 year old book for my sister for 50 cents. No such luck this year though. I got some great stuff for me and for my classroom. 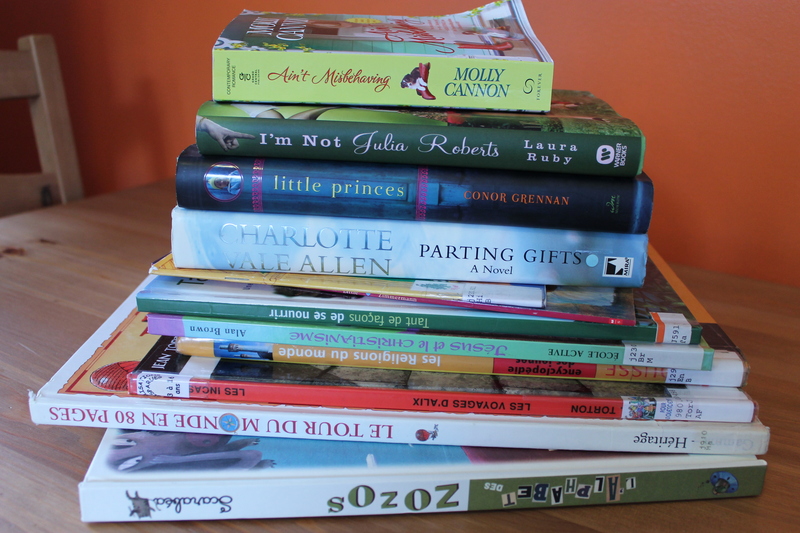 I got eight books for the kids and it cost me 12$. You can barely get one book for that price! They’re all in really good shape too. I got four books for myself and it cost me 5$ Not quite as amazing as the 25 cent books I got last week, but still a good price for someone who buys more books than, well, than anything else really! Today was day two of my 30 day yoga challenge. I usually go to yoga on Sunday morning, not afternoon, but today I was busy with the books, so I went to a beginner class in the afternoon. It’s nice to take an intro class every now and then. You really get into the foundation of the poses and you don’t just flow through them. It’s not as easy as you would expect because we get used to moving to a certain rythm and when you break a pose down into pieces, it takes more focus to get into it. It was a good thing I didn’t go to a power class because I had a headache and every time I put my head down in downward dog, it hurt more. I think it’s my fault. I didn’t drink enough water today. Oops! After class, I got my sticker! The girls made a sticker board where all the challengers can track their progress. It might seem silly, but getting that sticker is a great motivation! So that was my day as a Sunday girl, which is the title of one of the songs off She and Him, Volume 3. Here’s the video that inspired my look. I would have loved a crinoline and a bow, but I didn’t have either. I’ll definitely find a bow for next time I wear my dress! 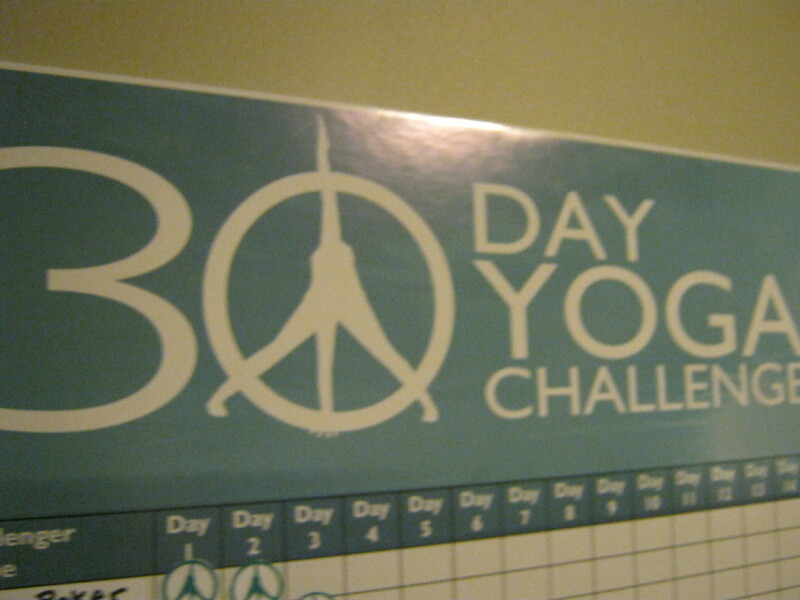 Today was the first day of my third 30 day yoga challenge. The first one was a personnal challenge I did with my friend Julie and the second was a fundraising challenge. This one is a studio challenge. Pure Yoga Ottawa, my home away from home, is hosting this amazing 30 day awesome-fest. 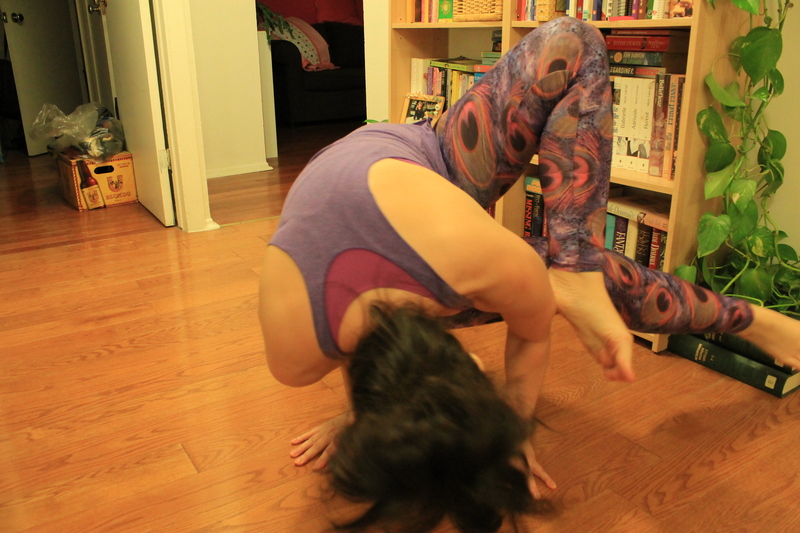 To make the rest of my challenge feel easier, I started off with the hardest yoga class ever. Ever. Ok, maybe it wasn’t that hard, but I haven’t done yoga in weeks because I was sick, and it was super humid on top of being hot, so it probably felt harder than it was. Anyone who thinks yoga can’t be a cardio workout should talk to Amber. We did about a million warrior one-chaturanga-updog-downdogs, quite fast and timed to some awesome upbeat music. If it wasn’t for the music and the fact that there were other people around, I might have curled up in a little ball and passed out. After class, there was a little presentation for all the challengers. We got to hear a naturopathic doctor speak about nutrition and how to stay healthy and hydrated during the challenge. She also gave us a gift certificate for either a naturapathic visit or a massage/salt scrub/acupuncture combo. I’m probably going to go with the massage combo, it sounds amazing! We also had a massage therapist talk to us about how to assess our bodies and prevent injury. It was all great information. Then we all took a picture together. I’m in the front row, third from the left. Amber and Jen, the owners of the studio, gave all us challengers awesome goody bags! 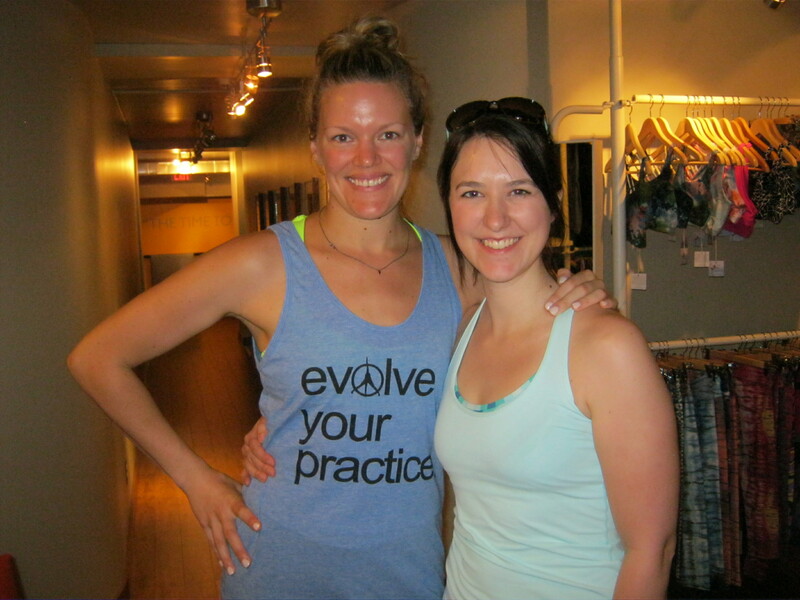 There was a tank with “evolve your practice” which is the studio’s new tagline. 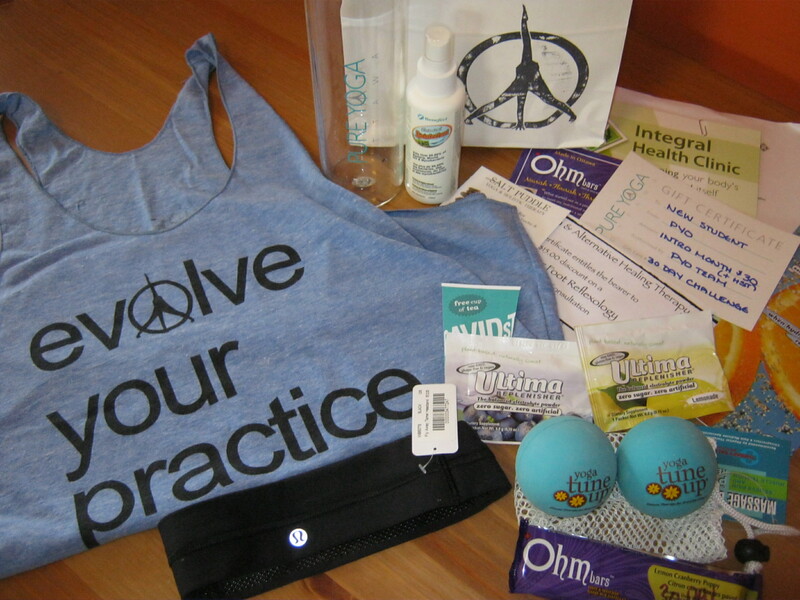 Also, a water bottle, some electrolyte drinks, a power bar, a lululemon headband, a voucher for free tea, yoga tune up balls, mat cleaner and other fantastic goodies! All in all, it was a great start to a 30 day challenge! I’m looking forward to the next 29 days!